This soundbar delivers a full-scale sonic assault in a minimalist package. 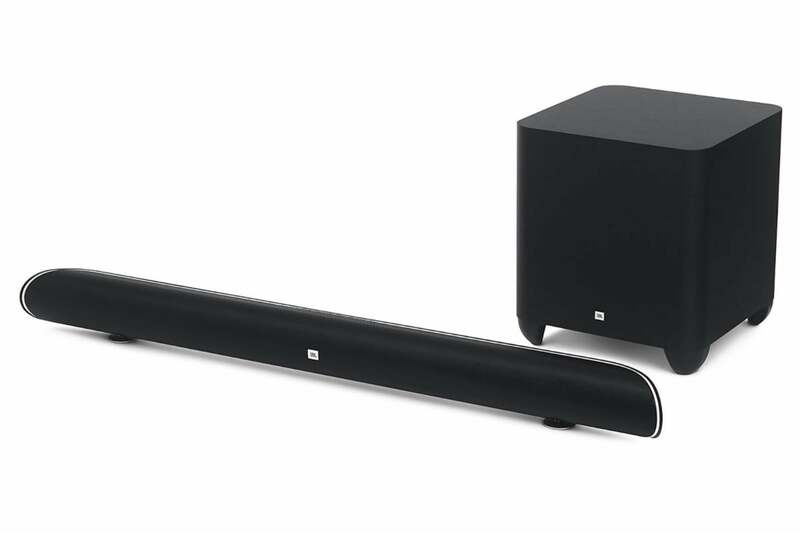 JBL's cinema SB 450 is one serious 2.1-channel soundbar. Beneath its 44-inch wide, 4-inch tall and 3-inch deep rounded soundbar sit two 2.25-inch full-range drivers per channel, with each channel driven by a 120-watt amplifier (240 watts in total). 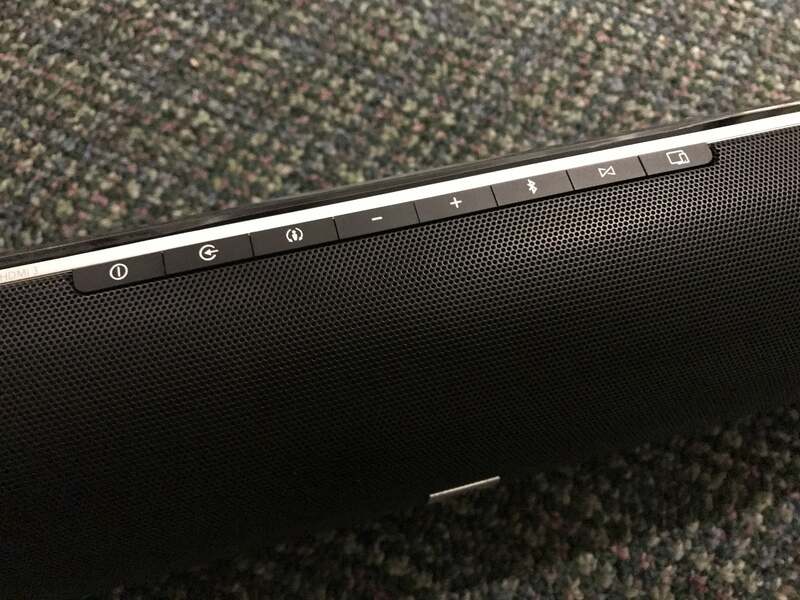 A hefty wireless subwoofer is included in the package. Weighing in at 21 pounds, this was the heaviest and largest sub among the units I evaluated at this price point. The JBL subwoofer, with it's rounded edges, resembles a black cube. It stands 13-inches wide x 14-inches high x 13-inches deep. The sub's front and sides are smooth thanks to the 8-inch downward-firing woofer. A 200-watt amplifier does all the heavy lifting. There's a large rectangular port on the rear of the sub. While the system is rated down to 40Hz the subwoofer's take-no-prisoners performance will sometimes fool you into thinking that the system plays deeper. The bass drums at the end of Rogue One: A Star Wars Story, Chapter 5: "An Urgent Message" at around 12 minutes, 17 seconds bang you in the chest and the immediate crash of the imperial prison transport that follows put you on notice that this JBL sound system is designed for maximum impact. The JBL subwoofer has a few advanced options that none of the other subwoofers in this roundup had. Look closely at the sub’s rear panel, and you'll noticed two adjustment options: One is for phase and the other is for crossover. Setting the right phase helps the sub's driver play in the same phase as the soundbar's drivers. It's important, and there's a way to measure which is the correct phase setting for a sub (you can read this and other articles on the topic if you want to learn more). The subwoofer has phase and crossover controls. But for our purposes, let me simplify things: If you're placing the subwoofer at the front of your room near the soundbar, you want to set the switch to the 0° phase position. If you position the wireless subwoofer behind your seating position or at the back of the room, then you want to switch the phase to the 180° position. Suffice to say you won't hurt anything by testing both positions. Simply keep the setting in the position that sounds best to your ears. Crossover frequency is the frequency where the subwoofer and soundbar's sound transition or cross over to each other. Get this right and the sub and soundbar will sound like a single, symphonic speaker. Get this wrong and you'll start hearing them as two distinct, disjointed speakers. The crossover frequency dial adjusts the subwoofer's cut-off frequency between 40Hz and 200Hz. The higher you set the crossover, the more it will overlap the soundbar's frequencies. Depending on your room acoustics, you might need to raise or lower the crossover control. Let your ears be your guide for the setting that produces the smoothest bass transition. An EQ switch will optimize the soundbar for wall or tabletop placement. These are two great options to you fine-tune the SB 450 to sound its best in your room. If you're a technophobe, you can always leave them in their default position. That's OK too. The SB 450 has you covered with inputs. It was the one of the few soundbars in this entire roundup to offer multiple HDMI input options. There are three HDMI inputs and one HDMI output with support for ARC (Audio Return Channel). ARC sends television audio back to the soundbar through the same HDMI cable. The SB 450 has multiple HDMI inputs. In case you're wondering, HDR brings a greater range of contrast and far more detail in bright areas than traditional standard dynamic range. The result is that HDR makes images more lifelike. You can read more about HDR in this article. 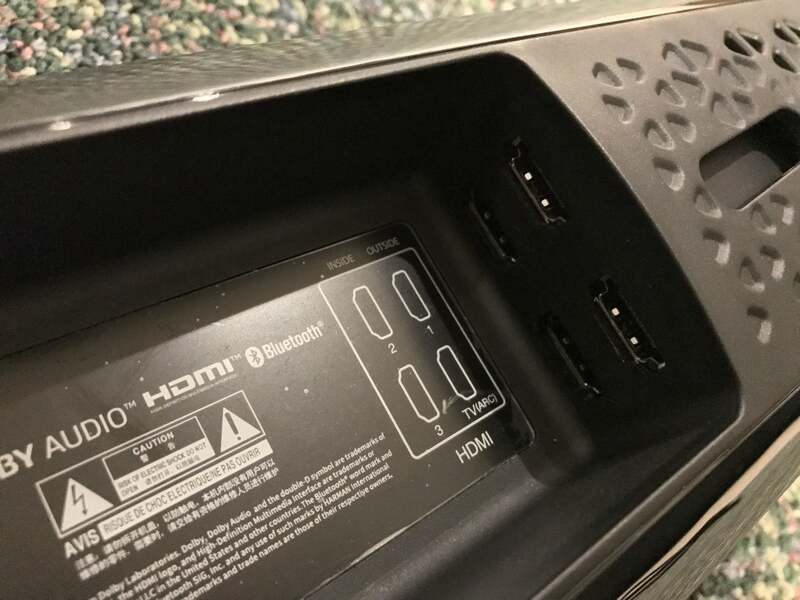 The only caveat to be aware of is that the JBL's onboard HDMI inputs do not support the latest and greatest HDMI 2.0b standard. HDMI 2.0b will be required for the forthcoming HLG (Hybrid Log Gamma) HDR standard that will be used in 4K Ultra HD television broadcasts. Should you have any HLG HDR sources down the road, you'll need to plug them directly into your TV, bypassing JBL's soundbar. This isn't major shortcoming, since widespread 4K broadcasting is some time out. There are very few soundbars that support HDMI 2.0a today, and even fewer that support HDMI 2.0b. 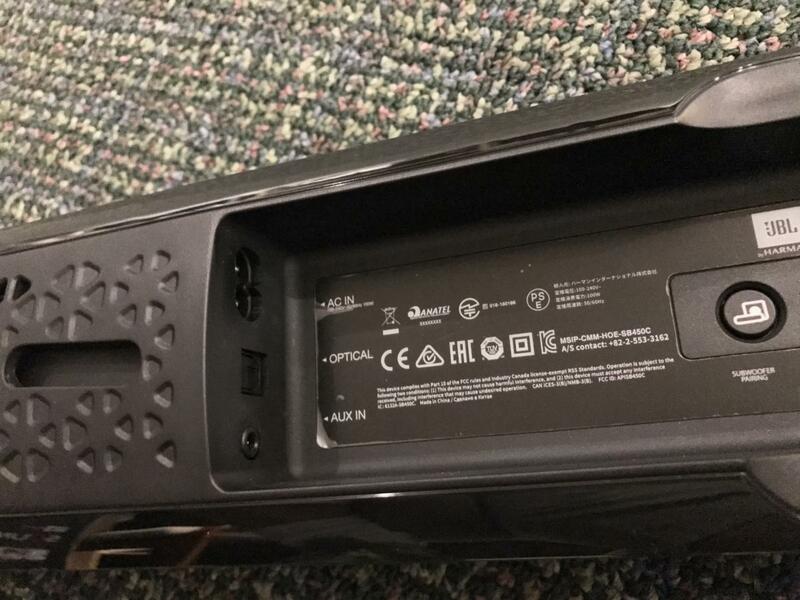 There are optical inputs on the back of the SB 450. HDMI aside, there is also a Toslink digital optical input, and Bluetooth. The USB port is for firmware updates only. 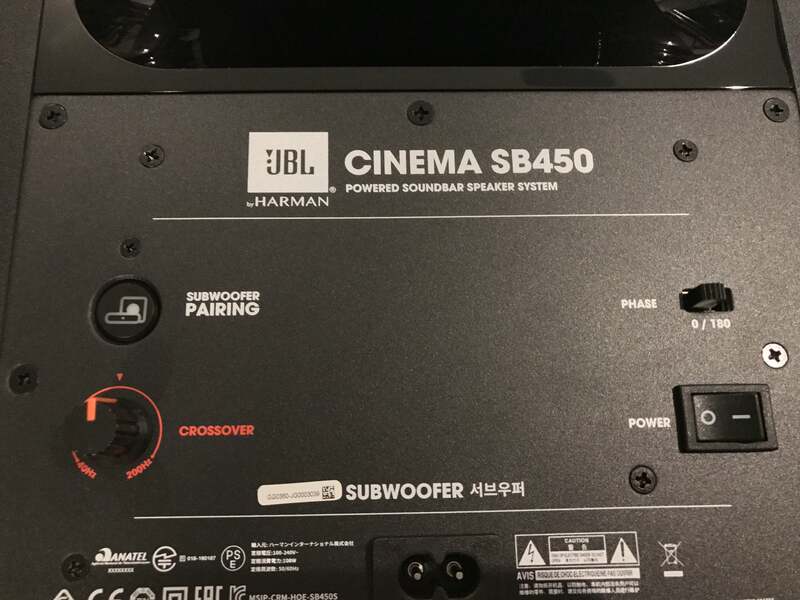 The JBL Cinema SB 450 doesn't have a whole-home streaming ecosystem like Sonos, Yamaha's MusicCast, or Denon's Heos. It does support JBL Connect, which allows you to daisy-chain two compatible JBL speakers wirelessly. Using JBL Connect you could theoretically pair an additional speaker to provide synchronized music in nearby rooms, or multiple locations in a single room. JBL connect works over Bluetooth. It's very simple and easy to use, and you'll find that in real-world use you can get line-of-sight range of up to about 30 feet. Some of the compatible models include the JBL Xtreme, the JBL Pulse 2, and the JBL Flip 3. The SB 450 is very easy to install and some users might not even need to refer to the user manual. That's fortunate, because the only documentation is merely a quick-start guide. There is no complete user manual--at least not in the box. The soundbar has physical controls along the top. That wouldn't necessarily be an issue, but a quick-start guide should have clear, easy-to-read steps with lots of clear visuals. This quick-start fails that litmus test and the type is microscopic. If you're over 40, you'll need a magnifying glass to read it. You'll be better off downloading and referencing the full user manual online here. Even if you can set up the soundbar easily, I suggest referencing the complete user manual since it goes into a lot more detail and has far greater explanation of the various features of the SB 450. I wish that JBL had a short web address on the included guide so you could access the user manual easily. I was disappointed by the included remote control. It is of the small, thin credit card variety. Wording underneath the buttons is ridiculously small and I can't imagine that an older person will be able to decipher any of them. Thankfully the most important buttons are easily decipherable by their symbols. 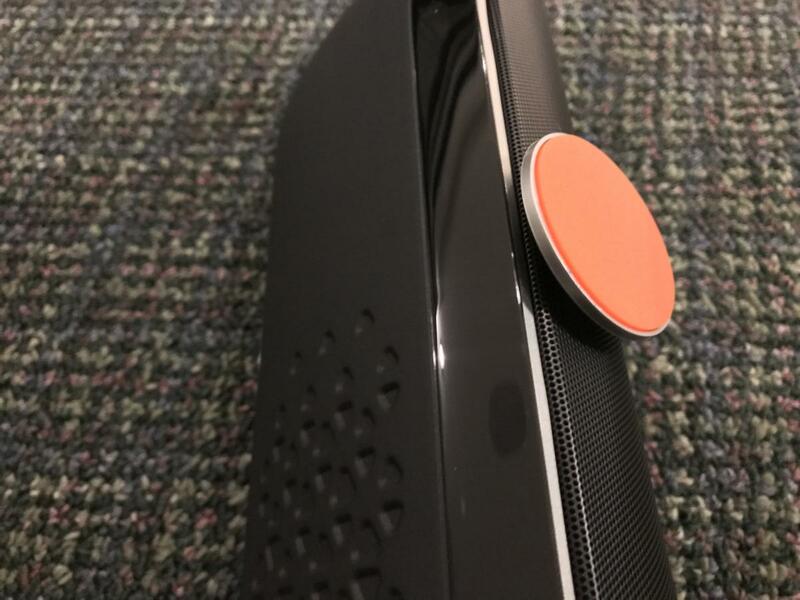 Harman smartly dedicated a button in the lower corner to Harman Volume. Harman volume is a feature that makes dialog more intelligible. Some people might find the performance of the soundbar to be so good that you won't need this feature. As with most dialog-enhancement technologies, engaging this feature thinned out the midrange a bit, but it also made dialog noticeably louder and easier to understand. You can attach the included feet for tabletop use. Rubber backs will prevent scratches. Because of the system's overall frequency response, I really liked the fact that I still got a satisfactory bass response with Harman Volume engaged. Harman Volume didn't introduce drastic acoustic anomalies that I experienced with some other soundbars. For example, in Chapter 25 of Rogue One at just past the one-hour-six-minute mark, Jyn Erso cries out "Father!" Unlike other soundbars I've tested, the JBL didn't produce any obvious audio artifacts in her voice as she yelled. The JBL SB 450's sonic performance was simply outstanding for this price point. Dialog, dynamics, and envelopment were top notch. The bass energy that the 8-inch subwoofer delivered was intense. Explosions, engine thrusts, and blaster fire in Rogue One had real bite. The subwoofer's performance was head and shoulders above any other at this price point. And that's a good thing: There is no subwoofer output on the SB 450, so you cannot add a different sub to the soundbar later. 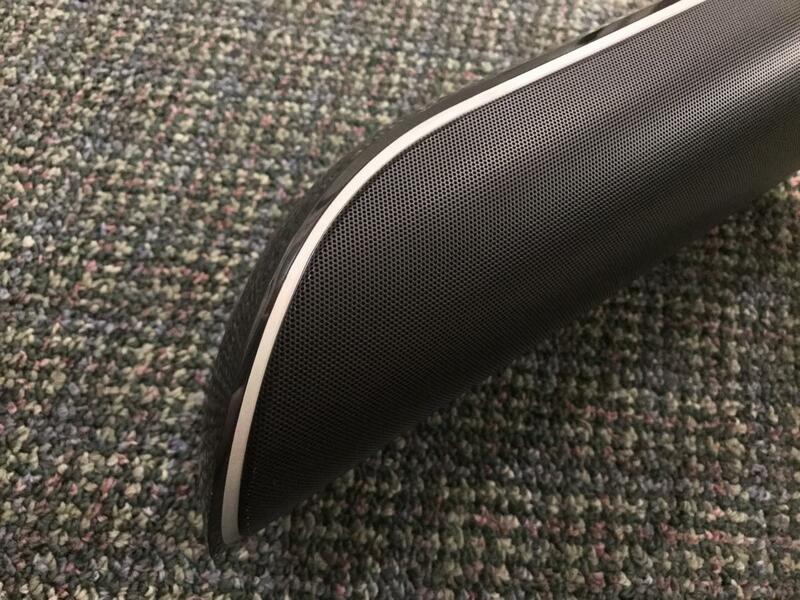 The SB 450 soundbar has slick styling and tapered ends. Many people judge a system by its bass response, but for me, a system's sweetness lies in the midrange. And the Cinema SB 450 soundbar delivers on that count. The soundbar's overall response was natural and well balanced in my room, but without the benefits of on-board EQ, your experience could be different. I didn't notice any overt midrange bloat and the SB 450 did a very good job of reproducing microdynamics and fine sonic details. This is one soundbar that could do double duty for music as well as movies and television programming. JBL's SB 450 delivers pure, unadulterated, sonic satisfaction that goes well beyond what you'd expect from a soundbar. The included cheap remote control and poor instructions are inexcusable at this price point. 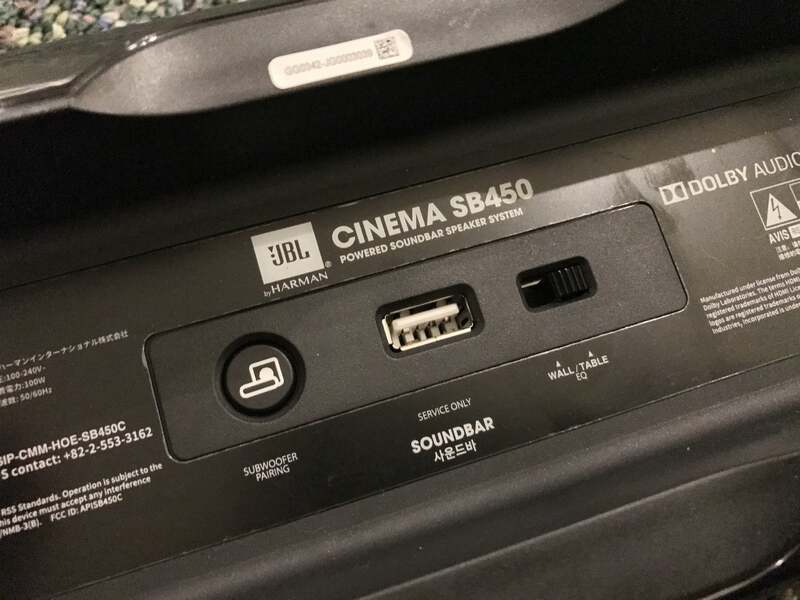 Those quibbles aside, if you don't need whole-home, multiroom streaming and are looking for a soundbar that can do double duty for both cinema and music, then JBL's Cinema SB 450 deserves your serious attention. This is one of the best mid-priced soundbars on the market. It will rock your home theater.